By Srinivas Chowdary Sunkara // petrobazaar // 27th January, 2019. Fuel oil prices gained momentum during the recent weeks, Negating some of its earlier losses. 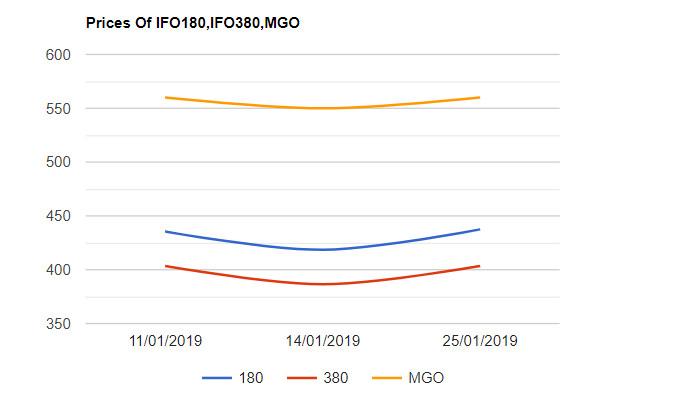 Both the IFO 180 cSt and 380 cSt graded fuel oil prices propped up moderately by around $2 or 0.57% for last two weeks. The MGO prices were gained by around $10 in Singapore fuel oil market. It was observed that the world's biggest port by bunker supply volume, Singapore, Finished the year with sales of 4.308m tonnes in Dec. Singapore's best-selling fuel grade, 380 cSt dropped YoY by 2.091m tonnes, or 5.5 percent while MGO sales were marginally up. Following the trend in the international markets, Fuel oil prices are very likely to go up for the first half of February, 2019. Good day to all.